BannerSpace.com, ad network and internet advertising solutions. 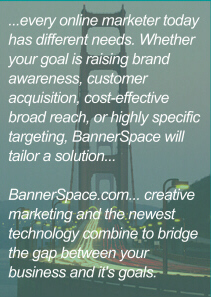 Much more than just an ad network, BannerSpace.com assists advertisers and agencies with every aspect of their campaign. Through innovative technology, marketing and media expertise, and brilliant creative BannerSpace creates campaigns that get results. Find out how BannerSpace can help you monetize 100% of available inventory and maximize your ROI. Whether you need to supplement existing in-house sales, or full service ad sales representation, BannerSpace continually strives to maximize your ad revenue.